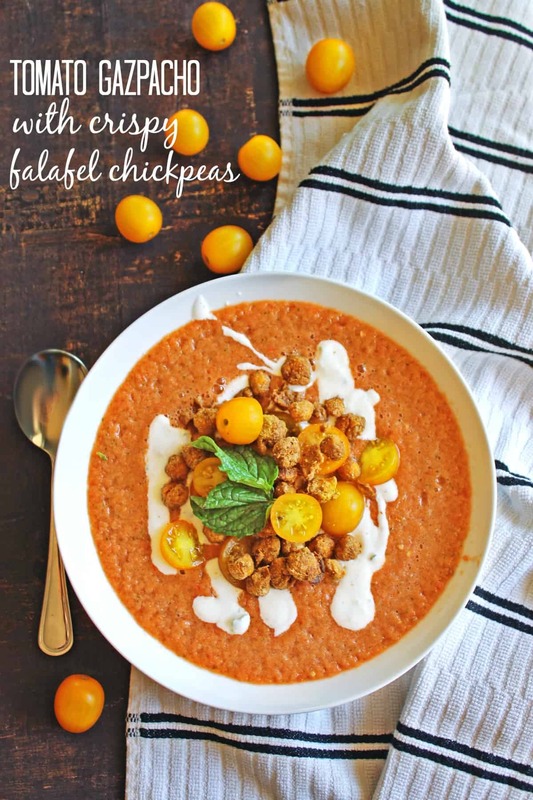 Tomato gazpacho with crispy falafel chickpeas recipe! Cold, refreshing, vegan friendly, gluten free. The perfect summer meal! Hello! This post was originally published in August 2015. I’ve updated some things and thought you might want to see it’s pretty face again. Enjoy! Hey friends! Here we are, with my first SUMMER recipe comin atcha. Tomatoes are one of my absolute favorite things about summer, specifically heirloom tomatoes. Gazpacho is a cold soup made from raw, pureed fruits or vegetables, and tomatoes are perfect for an easy, summery version of the soup. This tomato gazpacho with crispy falafel chickpeas is like eating a summery bowl of Mediterranean goodness! The crispy chickpeas are really where it’s at here. I thought they tasted JUST like little crispy falafel bites. YUM! The gazpacho is really simple and refreshing, the yogurt is really garlicky and minty, and the chickpeas are heavily spiced and tahini-y. Yes yes. Delicious amiright? I love that this recipe is really healthy and light, perfect for a warm summer night. It’s loaded with fresh vegetables, and has lots of protein from the falafel chickpeas and the yogurt. You will need a high speed blender. You’re blending up some seriously crunchy veggies, so the consistency will be at it’s best if you have a Vitamix or something similar. I used cow’s milk yogurt, but you could easily use dairy free yogurt to make this vegan. You do you! Any variety of tomato will work, but my favorite is very ripe heirlooms. Preheat the oven to 400 degrees F. Line a baking sheet with parchment paper for easy clean up (optional). Toss the chickpeas in the tahini, oil, coriander, and cumin. Season with salt and pepper. Spread evenly on the parchment paper and bake for 30-40 minutes, or until chickpeas are crisp. Let cool. Meanwhile, hull tomatoes and score a large X in the bottom of each one. bring 6 cups water to a boil in a medium saucepan. Prepare an ice bath large enough for the tomatoes. Drop tomatoes into boiling water, and blanche for 30 seconds, or until skin starts to peel. Remove tomatoes and plunge into ice bath. Peel skin, and cut into quarters. Puree tomatoes in a blender. Add cucumber, bell pepper, and onion and blend well. Season with salt and pepper. Refrigerate. Meanwhile, combine yogurt, mint, garlic, and water in a small bowl. Stir well. Season with salt and pepper. To serve, divide gazpacho evenly among 4 small bowls. Drizzle a bit of yogurt, then top with cherry tomatoes and crispy chickpeas. I hope you try out this recipe! Don’t forget to tag #Rhubarbarians on Instagram if you do! 15 killer Mother's Day recipes for pregnancy! That looks perfect for a hot summer day! I love soups like this and since I just got myself a high speed blender it seems perfect to try out. Could this recipe BE more perfect for this time of the year?! I think NOT! This looks so divine! I love the idea of tossing the chickpeas with tahini in addition to the olive oil to really bump up that falafel flavor. Delicious pictures! Thanks Emily! I love adding crispy chickpeas to EVERYTHING! Holy Tahini Batman! Those falafel chickpeas are brilliant. I’m SO trying those. Thanks Beth! Let me know how you like them! Those falafel chickpeas are genius!!! Can’t wait to try this cuz I’m also swimming in tomatoes. Thanks Christine! Let me know what you think! I have an arsenal of tomoatoes from my garden and now I know exactly what to do with them! Gorgeous photos, Tricia! Thank you so much! Hopefully you have a better blender than me. Haha! OMG!! YES!! Cold soup is eeexactly what I’d love to have for dinner now. In Montreal we have like 10,000 degrees and I’m hungry for something cool like this! Thanks Lorena! The weather has been turning a bit already here. We went from 90+ degrees to about high 60s. Now I’m craving soup and pumpking recipes!